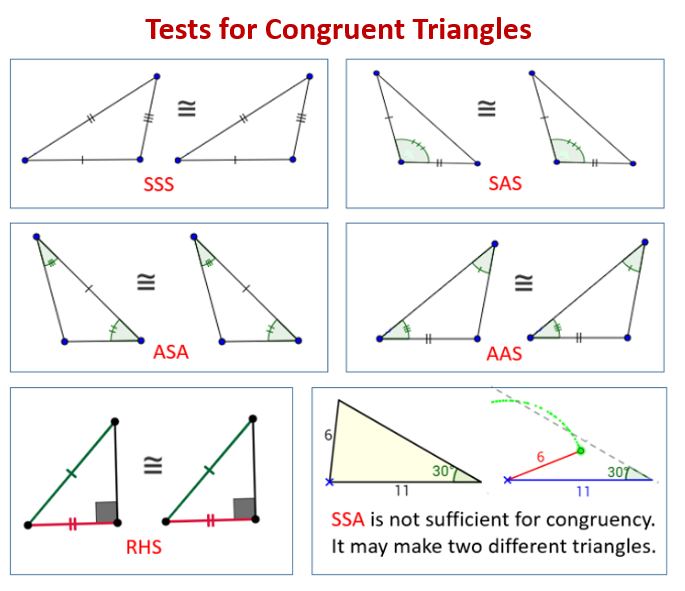 The following figures give the Tests for Congruent Triangles: SSS, SAS, AAS, SAS, RHS. Scroll down the page for more examples and solutions. This video looks at triangle congruency. How one triangle is an exact copy of another in terms of its sides and angles. The five tests (SSS, SAS, AAS, SAS, RHS) to show that one triangle is congruent to another are each explained. The special case of right-angled triangle congruency is dealt with in some detail, using Geogebra constructions. Three worked solutions to congruency problems are explained. How to derive the rules?